What could be more attractive than a wood crate filled with flowers? Only real live flowers in a wood crate! The Wood Words Bundle was one I couldn’t wait to play with. I’m thinking these might be wedding favors for my youngest daughter’s wedding this October. The third year in a row that one of our children is getting married! Our oldest daughter, Courtney married her husband Cyle in October 2015. My son married his wife, Stephanie, in October 2016 and now our youngest daughter, Lindsay will marry Zach this October! The October wedding’s weren’t planned to be the same month, it just worked out that way. We are so pleased with the choices our children made about the person they each want to spend the rest of their lives with. I could write a book about all the things that are good and right about their relationships, so I won’t even get started. Okay, enough of that, onto the cards! This first one has a color combo that I’ve always loved. Blue and yellow. 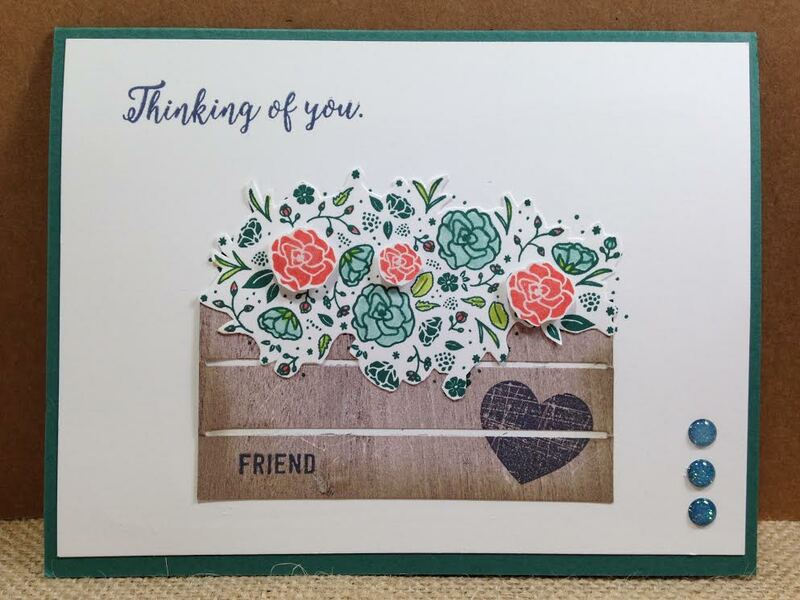 Dapper Denim is the perfect blue for these So Saffron and Daffodil Delight, (with a little Calypso Coral), flowers, from the Jars of Love stamp set and die cuts. 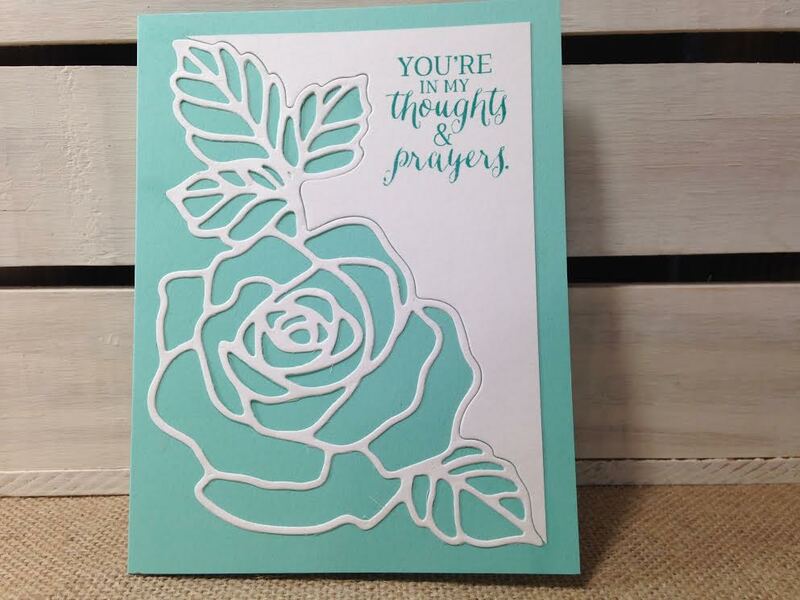 The happy birthday sentiment is from the Rose Wonder stamp set. Tranquil Tide, Calypso Coral, Pool Party and a little Lemon Lime Twist are the colors I chose here. This card was part of a Color Combo challenge, as was the card after this one. 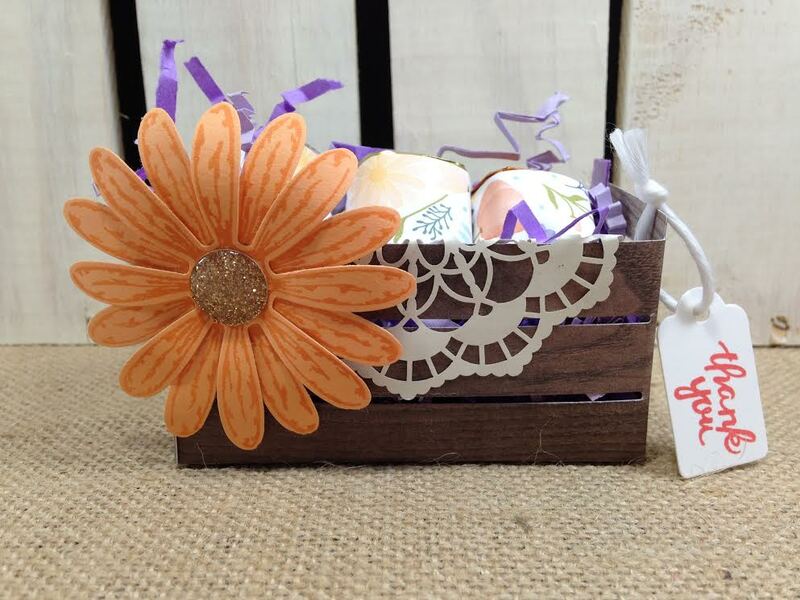 Tranquil Tide, So Saffron, Sweet Sugarplum and Peekaboo Peach fill this wood crate up with color. 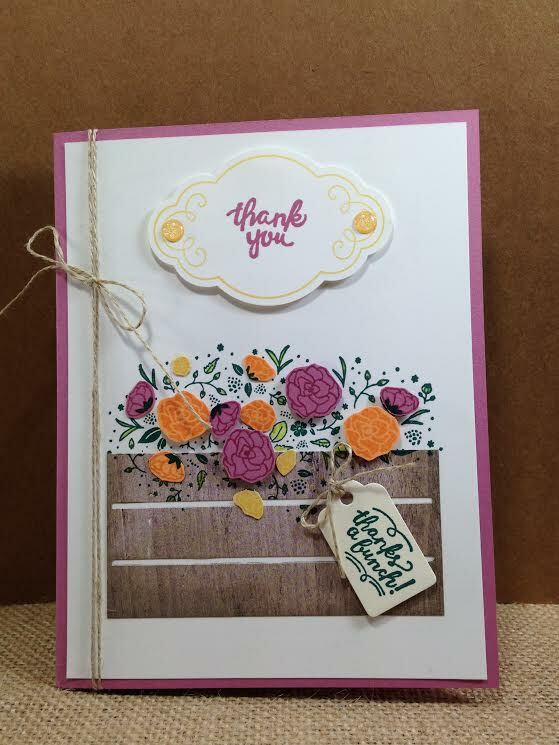 I fussy cut all the raised flowers on this card, as well as the card above. 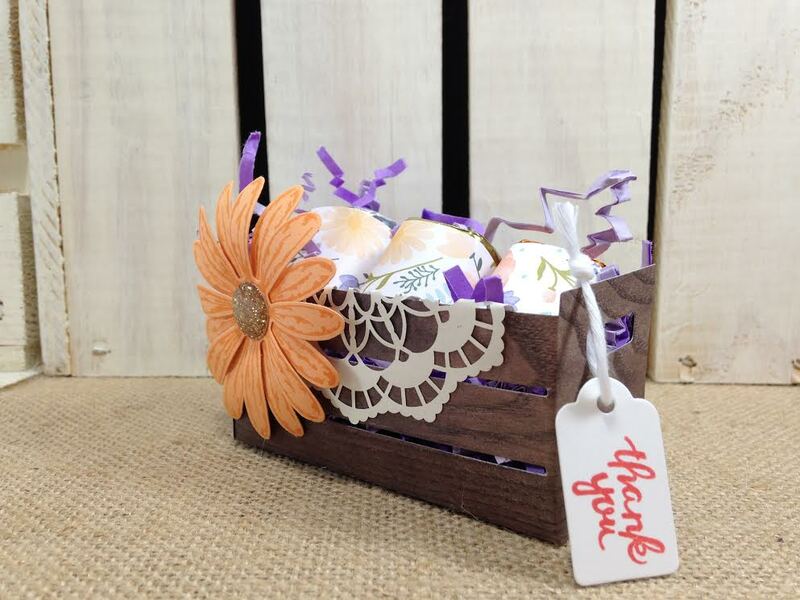 How cute is this darling wood crate in 3D?? 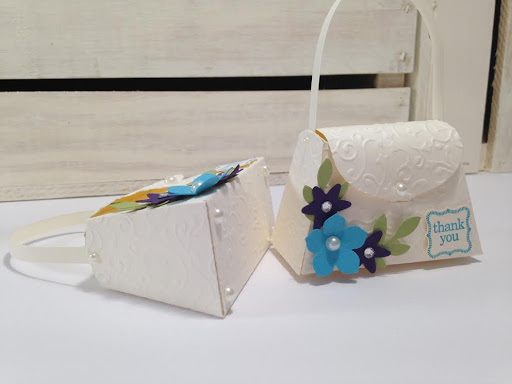 And paired with the new Daisy from the Daisy Delight stamp set! The Hershey Nuggets are wrapped in the new Delightful Daisy dsp. The center of the flower is a piece of glitter paper punched out with glue from the Fine-Tip Glue pen. If you’d like to see these products and more, (excluding new products that will not be available until tomorrow!! 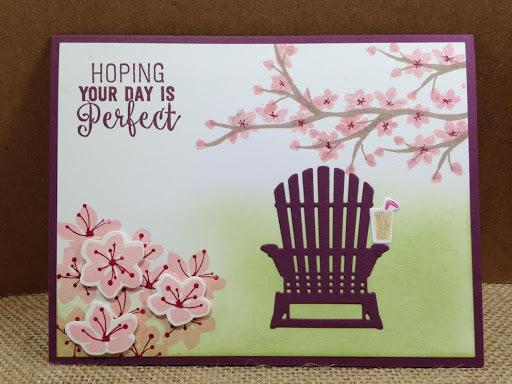 ), just click on the one of the catalogs to the right or click on the Stampin’ Up Logo to go to my store. Please leave a comment or a question if you’d like, I’d love to hear from you! Thanks for checking out my creations! Alison is my youngest daughters best friend, she is also our “bonus daughter”, she doesn’t need another Mom, hers is fabulous…and her Mom is alot of the reason Alison is so fabulous. We just decided to adopt her and her fiance’ into our family, too! My daughter is her Maid of Honor and threw her a Bridal Shower this past Saturday. 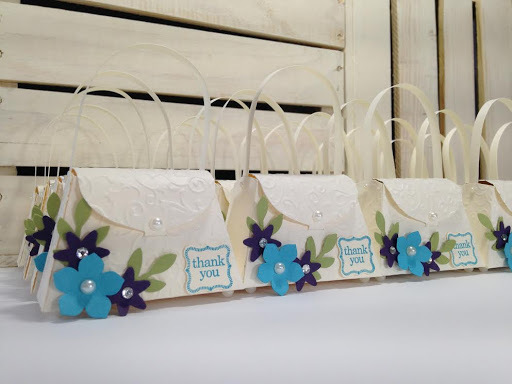 Of course, I offered to make the favors and Thank you notes! Except for the ink, all of these products are now retired or will retire on June first. But look how charming these are!! 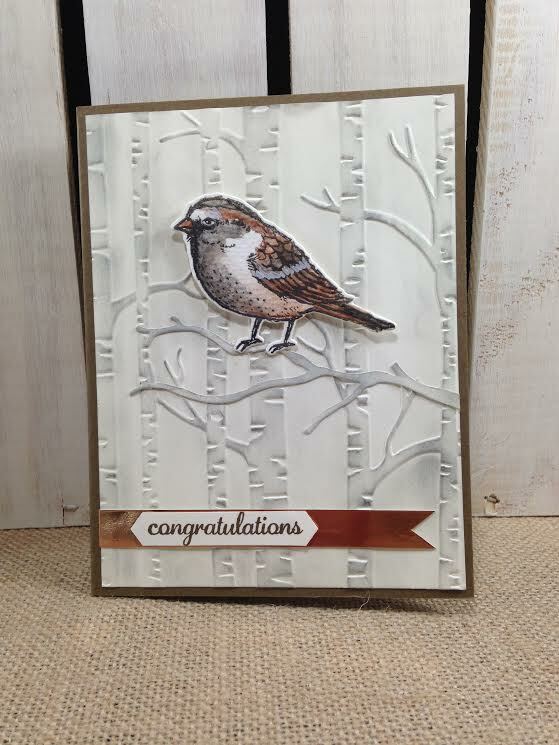 I’m so glad I got this die cut when I had the chance, which leads me to my point…If there’s a product available that you LOVE, not just love, one you just have to have…well, my vote is to get it, because once it’s retired it’s too late!! I bought this die when my youngest was still in high school. I played with it quite a bit, but never gave any away. I finally got to make a bunch and give them away! It’s so fun seeing everyone’s delight, not only about the cuteness factor but the that they get to take one home for themself! I hope these creations inspire you to not only create something beautiful, but to give it away to someone you care about, to experience the joy of giving from your heart! Don’t these chairs make you want to just sit on the beach or in a beautiful park, sip your favorite drink and read a book or chat with a loved one? My husband built two arbors in our backyard, one has a swinging bench, the other has 2 chairs and a cafe table under it. Those spots make me feel the same way these cards make me feel. When the grapes are getting ripe and the jasmine fills the air with their perfume, it is so relaxing to sit out there! We even have a small fountain in between the arbors that add to the ambiance. Unfortunatley it is very windy where I live and more often than not it is too windy to sit out there comfortably. Well, I’ve decided there is no wind in these cards scenes! Just comfortable rest and relaxation! I participated in a Color Combination Challenge, this card is one of my entries. I used Melon Mambo, Island Indigo and Lemon Lime Twist ink to sponge and blend the colors, a technique I tried for the first time. The chair legs are Early Espresso, the seat is Island Indigo, the drink Melon Mambo and the umbrella Lemon Lime Twist. The Weather Together Bundle with that irresistable little umbrella will be going up in price come June 1st. The bundle is available with a 10% discount until May 31st. Click the link at the bottom of this post to go to my store and order this sweet bundle! I’m not really a dog person, it took my husband and kids 3 years to talk me into getting a dog. They finally broke me and we got a yellow lab. Three guesses who did most of her caretaking? Yep, it was me. I soon learned that nothing beats the loyalty of a dog, they are so faithful and forgiving. Yeah, her fur was a huge pain…who knew short hair doesn’t mean less volume of fur! She chewed most of the trim off our shed, and garage side door among other things, but there were far more fun times with her than the times she was a pain. Although I have no plans to get another dog, I miss our lab, Zoie, I still expect to see her in the backyard sometimes. 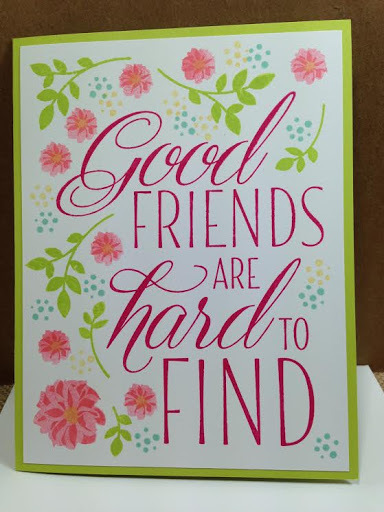 These cards make me think of her because she was a true friend to each member of the family. Always happy to see us! One of my new all time favorite colors, Lemon Lime Twist! 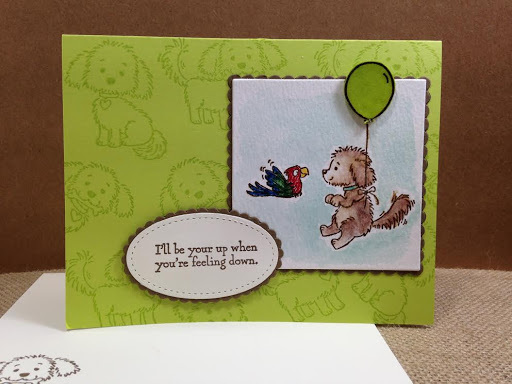 I used it for the card base and the balloon, (from Balloon Celebration). 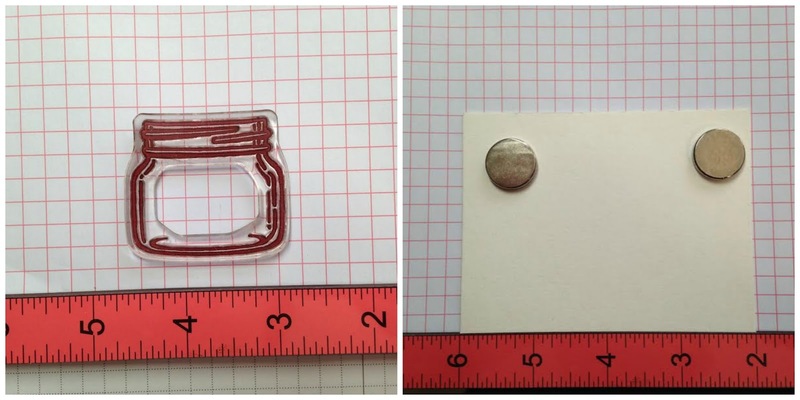 I also, heat embossed clear embossing powder on the balloon, twice, so it would look shiny like a real balloon. Soft Suede is the scalloped background matting and the color of the dogs fur. The parrot is Real Red, Garden Green and Pacific Point markers. I used Soft Sky around the animals and used watercolor paper for the images. 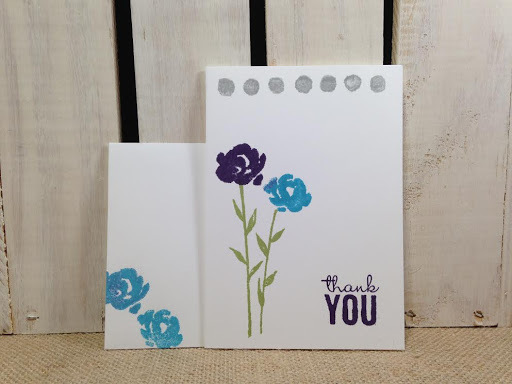 The sentiment is stamped on Whisper White card stock. I can’t post the links to most of the products, used on the second card until June 1st. With the exception of the following inks, Melon Mambo, Pool Party, So Saffron and Flirty Flamingo,(stamped off and full strength). This is my first tutorial on my blog! Yay! I definitely could use some feedback on this so I will know if I am clear and if the instructions are understandable and reproducible! 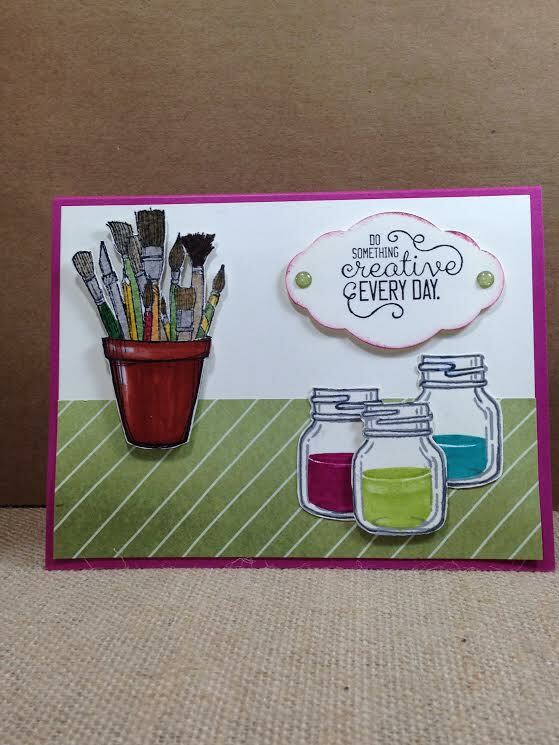 I wanted to make a card with the new Crafting Forever stamp set, using the stamp with the pot and paint brushes, and use the Jars of Love smallest jar to make paint jars. The scale was just too far off. So I was determined to make the jar smaller! It’s still a little off scale but it looks okay. Instead of putting the paint brush pot in the foreground, it was moved to the background to help with the scale. 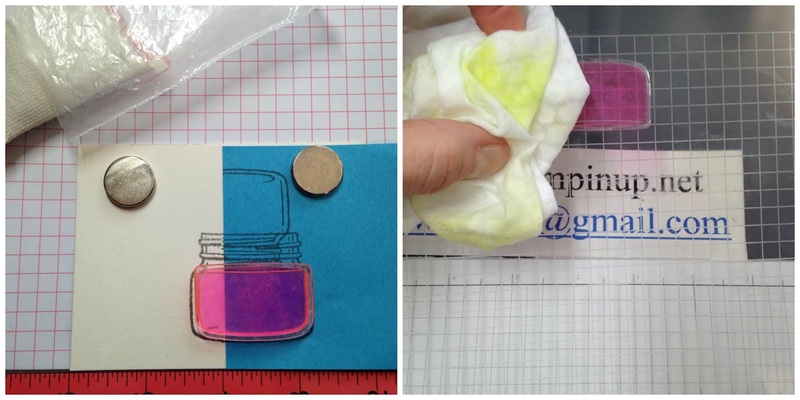 In the following photos, you can see my stamp lying face down on the paper in my Misti. I used the 4 inch mark as my center, you’ll see why as we go along. I leveled it best I could by eye-balling it and using the graph paper. I picked up the stamp with the Misti “lid”. Then I centered and secured my paper. 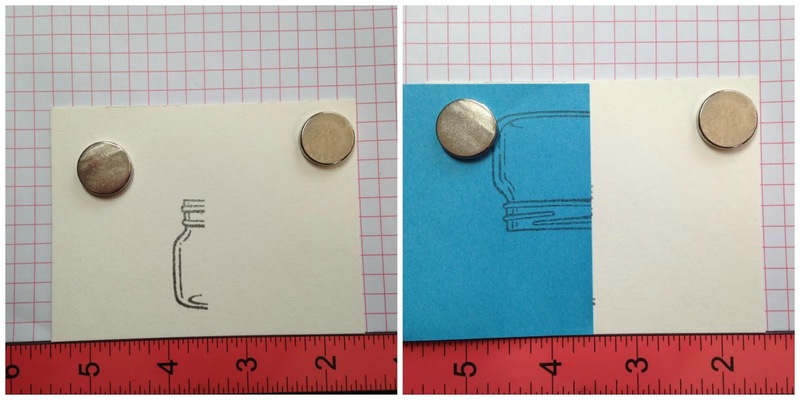 Next, I put a post it note at the halfway mark, 4 “, lining the edge of the post it with the edge of the Misti to ensure the post it was perpendicular to the edge. Then I stamped my image. 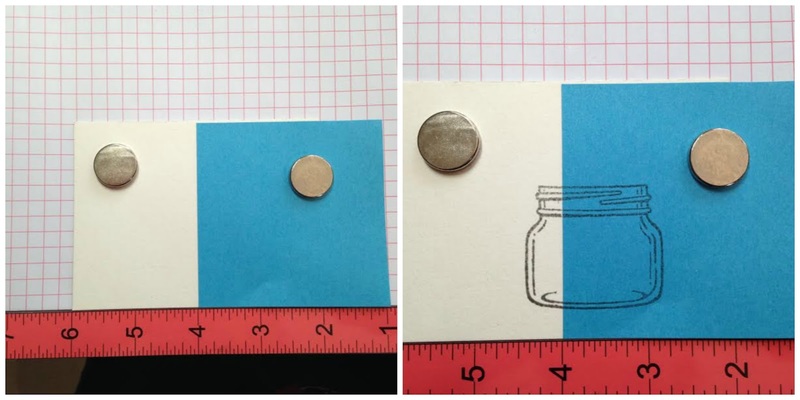 You may be able to see now, that essentially I am “cutting” a half inch out the middle of the jar. To do that I moved the paper to the right by 1/2 and inch. I also moved the post it note to cover most of the image, keeping the middle edge as perpendicular as possible. It’s hard to see here, but a very tiny portion of the half jar is sticking out from under the post it note. I then inked my stamp again and stamped the other half of the jar. Ta Da! I have a smaller jar! 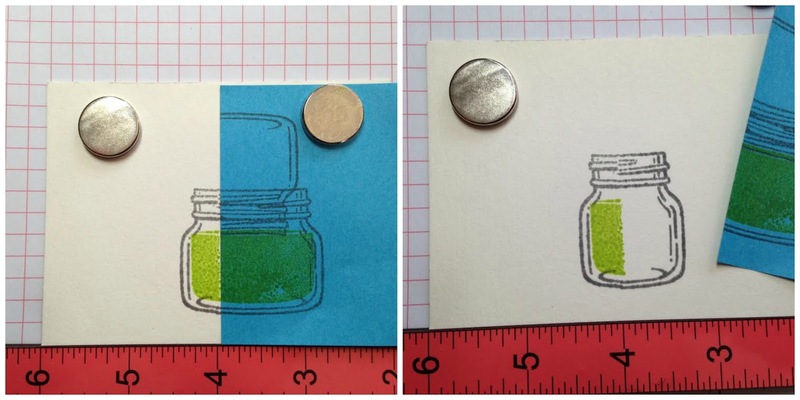 I had to connect some of the lines in the middle of the jar because the two sides don’t match perfectly. I used watercolor paper because it is a lot more forgiving in terms of the color of ink being consistent on both sides and lessening the sharpness of the lines between the two halves. This is especially helpful with the “paint” inside the jar. Now for the paint. In the card I made, at the end of this bog, I hand colored in the paint. This time I wanted to see if the stamp that comes with the set could do the job. I laid the stamp down where I wanted it. 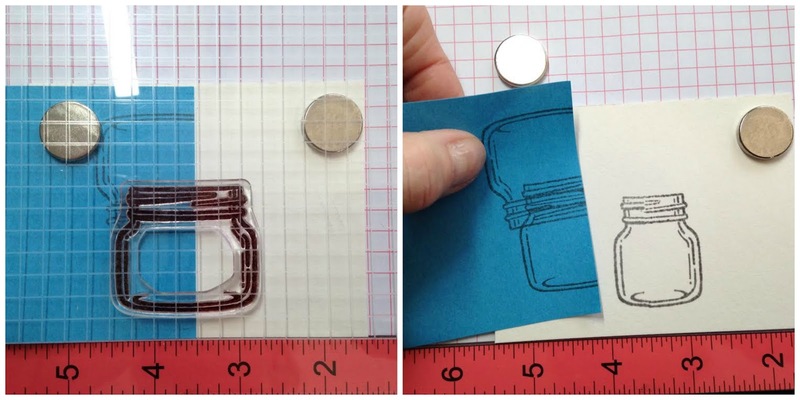 I ended up using the embossing buddy on the stamp so it wouldn’t stick to the paper while trying to center it. In the next photo you see me cleaning off the powder from the embossing buddy with a baby wipe. Then I followed the same procedure as I did while stamping the jar. I started by centering the paper, at the four inch mark, and stamped half of the paint. I then moved the paper 1/2″ to the right, covered half of the jar with the post it note and stamped the other half of the paint. By using watercolor paper the line down the middle of the image is very slight and filling it in on both sides was easy because it blended the ink very well. 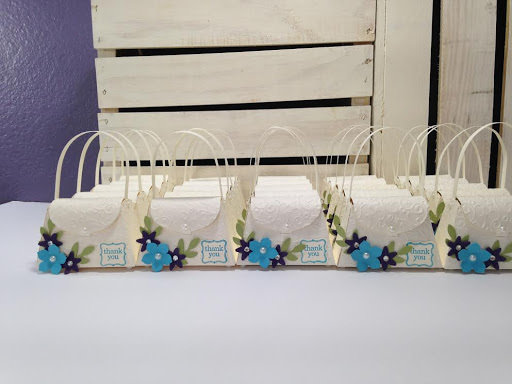 The jars below were done on Whisper White card stock. It definitely looks better, with smoother transitions on the water color paper. I hope you enjoyed this tutorial and will give it a try! Everything you see here is new products except the Jars of Love stamp set. On June 1st, I will be able to start posting links to the new products. Other than being a collector of all things stamping, I’m not really a collector. But, if I were a collector it would be of birds and birdhouses. I will just have to content myself with making bird cards, because I really don’t want to take care of a pet bird. I just like to look at them and their beautiful decorative wire homes. This first card, I cased (case=copy and share everything), from my friend Kristine Compton. 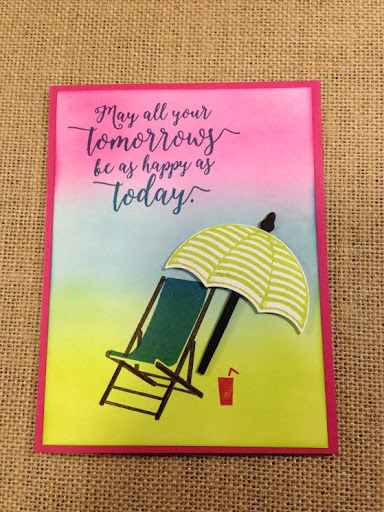 (And it’s a sneak peek of one of the cards at our next card buffet on June 20th) Her colors were different and I made a couple other small changes but this is pretty much the card she made. I loved it! 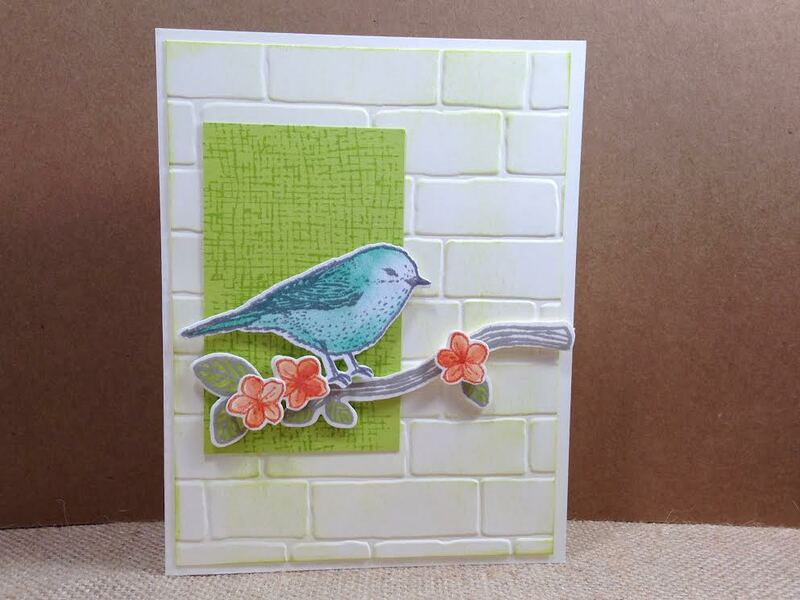 The bird next to a brick wall on a branch, just so stinkin cute! I used the new In Color, Lemon Lime twist, Pool Party for the bird, Sahara Sand, (stamped three times to get the color darker) and Tangerine Tango. I did this card as a color combo challenge. At first I wasn’t too sure about the colors, but I really like the color combo now! I had some birds that I had water colored, leftover from a previous Best Birds card design and decided to give one of them a different environment. Trees are the perfect environment for a bird, don’t you think? I made it a college graduation card for a friend of my youngest daughter, Lindsay’s. In fact, her best friends, fiance, Billy. 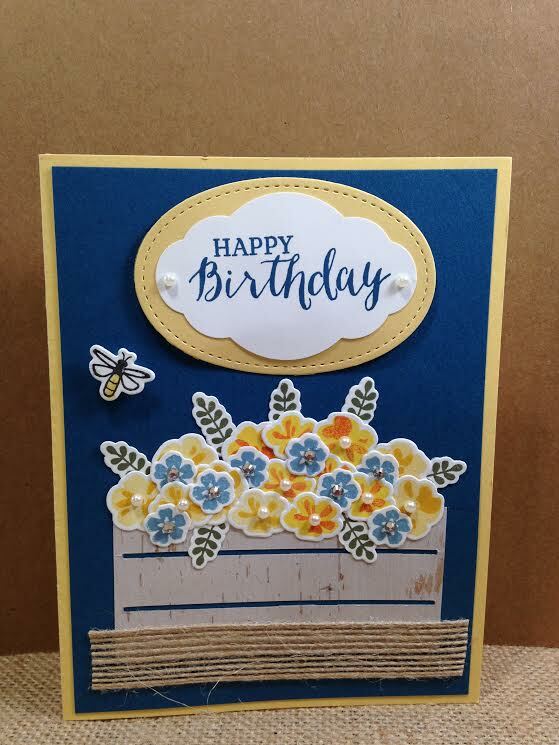 I used Soft Suede for the card base and Very Vanilla for the background. I sponged it with Basic Gray. The branch the bird is sitting on is from the new Seasonal Layers Thinlits. Copper foil is under the sentiment, that I used the Classic Label Punch to make. This Best Birds set will no longer be at a bundle savings price of 10% starting June 1st. Be sure and use Hostess Code: FE6A9QKN if you order before May 25th. Thank you for taking a peek at my cards. I’d love to answer any questions you may have or feel free to leave a comment below!